Intent on returning the Mandalorians to their warrior ways, the Pre Vizsla's Mandalorian Fighter LEGO Play Set features Pre Vizsla. He's returning to his secret base in his Mandalorian Fighter, the Gauntlet, after striking a deal with the evil Separatists. Can Obi-Wan follow him and prevent Pre Vizsla from plunging the galaxy into turmoil? The Gauntlet features rotating wings and turning cockpit for flying or landing modes, retractable landing gear, opening cockpit and cargo hatch. 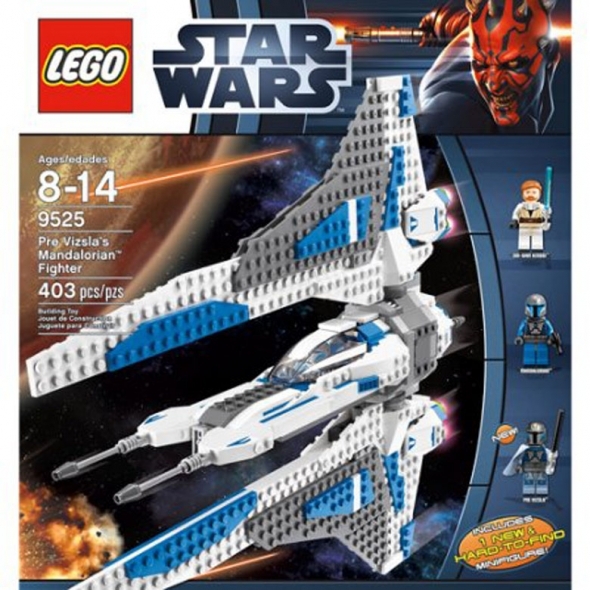 Pre Vizsla's Mandalorian Fighter LEGO Play Set comes with Pre Vizsla, Mandalorian and Obi-Wan Kenobi minifigures.